Copyright 1996 - Bat Research, 37:42-48. Official and unofficial aviation insignia began to flourish during World War One (WWI), and many of the WWI designs are still in use today in the British and U.S. Air Forces. The first semi-official organizational insignias for the U.S. Navy began to appear in the fledgling Naval Aeronautical Organization in the early 1920's. Official insignias were placed on squadron aircraft, equipment, stationary and the aviator's prized leather flight jacket. 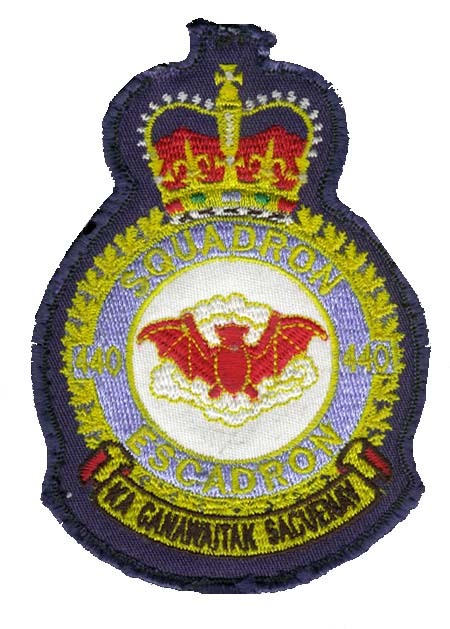 (A squadron is an organization established to perform a specific mission or task). By the beginning of World War II (WWII), all Army Air Corps and Naval/Marine Aviation squadrons and aircraft carriers had official, distinctive insignias. New designs, both official and unofficial, flourished during WWII and were placed on aircraft, ships, submarines, and even Army tanks and vehicles. the United States were most often in caricature form in contrast to Great Britain and its associated military forces that used the more formal heraldic design. However, since the 1970's, official insignias of U.S. military aviation units have become more formal in size, design and shape, conforming to regulations that shy away from humorous cartoon caricatures and politically incorrect designs. 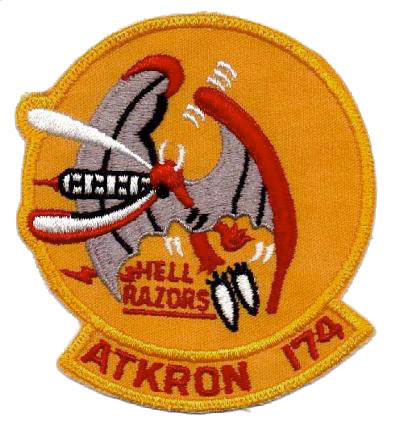 Nevertheless, unofficial squadron insignias still appear in squadrons, often displaying irreverent humor (Nelsen and Parsons, 1990; Roberts, 1995). In most cases, squadron insignia depict the various functions or missions of the unit, and squadron heraldry was often shared among sister squadrons in the same air group or combat wing. 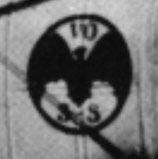 These insignias were often transferred after nomenclatural (administrative) redesignation, taken on by another squadron after the original squadron was disestablished, or sometimes maintained even though the mission of the squadron changes (e.g., from fighter to attack squadron). 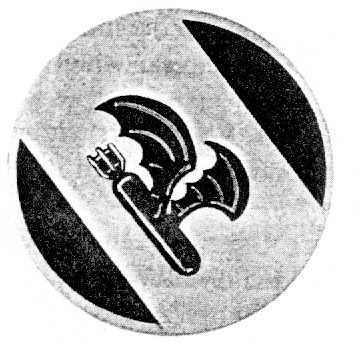 The earliest, if not the first, use of bats in insignia of U.S. Naval squadrons is found in Observation Squadron VOS-3S, circa 1923. Ironically, their scout aircraft were so poorly suited to observation duties that both pilots and the observers complained of being "blind as bats". During this time, observation squadrons which often flew out of Guantanamo Bay, specified a "Cuban bat" (perhaps Artibeus?) to represent their "blind" status. 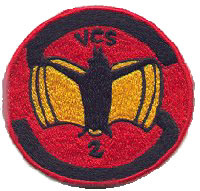 The improved logo stuck, and was used by the squadron as its designation changed to VS-5S, VS-5B, VCS-2 and finally VS-6S (Table 1) until it was disestablished in 1937. 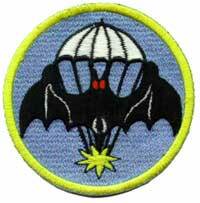 Despite this unfortunate introduction into military service, bat insignia soon came to dominate emblems carried by nightfighter, patrol, and observation squadrons because of bats' remarkable ability to navigate in the dark. 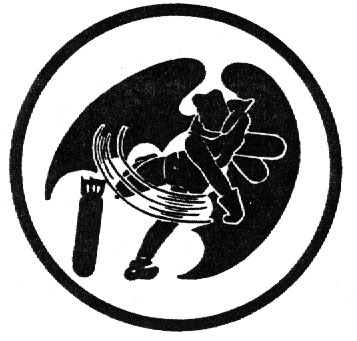 The rationale provided by each squadron for using a bat in their "official" insignia varies: "Radar is the third eye of the all-weather night pilot," "(Bats) embody the qualities of ferocity, determination, and aptitude in the use of all airborne weapons," "The bat is a predatory creature who hunts his prey at night using a natural detection system to locate, identify, track, and strike not unlike the Grumman A-6 Intruder attack aircraft," "The bat represents Beelzebub, the Prince of Demons in Milton's 'Paradise Lost'". Bats were never quite able to compete with "pin-up girl" nose-art that graced many aircraft during World War Two, though the Vargas-like pin-up figures of Batgirl used by Patrol Squadron VP-24 and Nightfighter Squadron 103 are fine efforts. 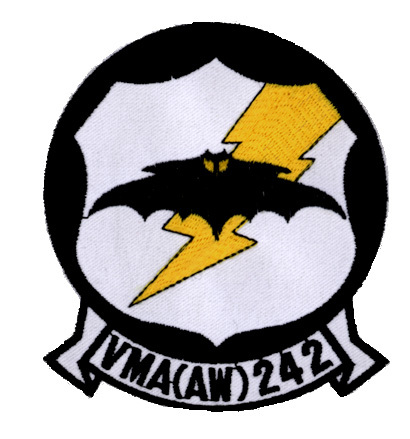 It is of interest that in today's "politically correct" Navy, VP-24's Batgirl had been the sole survivor of a long lineage of officially sanctioned but less-than-correct, insignia. 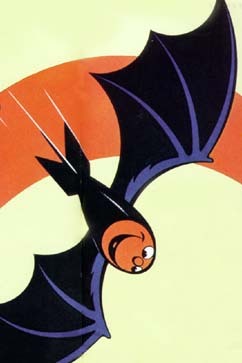 Bat caricatures were the clear choice of squadrons that carried the Bat glide bomb (see below) and Walt Disney even got into the act and drew up bat cartoon figures for Night Torpedo Squadron VT(N)-90 and the lineage of squadrons named "Hell Razors" (sic): VB-81, VA-13A, VA-134, VF-174, and VA-174. Disney studios went on to produce some 1200 military insignia of all types during the second World War (Rawls, 1992). Left to Right: Patrol Sqd. VP-24; 449th BS Bombardment Sqd. (Disney); Attack Sqd. VA-174 (Disney). Couffer's (1992) enjoyable book, "Bat Bomb," is a great story about an idea that wasn't. The following quote from McCracken's correspondence with R.A. von Doenhoff of the United States National Archive concerning Project X-Ray (McCracken, 1990) briefly summarizes this debacle. "Project X-Ray was an experiment undertaken by the Department of the Navy to determine if incendiary devices attached to bats would be useful if they were released form aircraft over major Japanese cities. The theory was that the bats would be released just before dawn with incendiary devices with timers attached to each bat. As daylight approached, the bats would head for dark recesses of wooden Japanese houses. When the bats were safely asleep, the incendiary devices would ignite, thus producing a conflagration of unprecedented proportions. A test run of this theory was carried out in the southwestern United States. However, the advent of the atomic bomb rendered this experiment moot." Despite the failure of Project X-ray, a lesser-known weapon system named Bat did in fact exceed expectations and was active in the arsenal of the United States Navy from 1945 through 1953 (Buford and Boyd, 1953; Huff, 1950; Van Vleet et al., 1981). Indeed, the Bat air-to-surface missile (ASM-N-2: Special Weapons Ordnance Device--SWOD Mk 9) was the first fully automatic guided-missile to be used operationally by any of the combatants during WWII (April 23, 1945). Once launched, the Bat went solo, guided to its target by an early S-band radar unit, developed by the Bell Telephone Laboratories. There were many wire-, radio-, and television-guided bombs, either glider-type or self-propelled, that were used by the Germans and Americans during the war (e.g., Henschel Hs-293, GB-4), however, the Bat was the very first, fully-automatic, weapon system, the archetype of what we now term "fire and forget" weaponry. BAT ASM-N-2: Special Weapons Ordnance Device - SWOD Mk 9 (Charles Register). Several aircraft carried the Bat. The Consolidated PB4Y-2B Privateer patrol bomber was the first aircraft to do so, however, after 1950, Privateers were replaced by the remarkable Lockheed P2V-5, -6B, and -6M Neptune (Davis, 1987; Huff, 1950; Mutza,1996; Van Vleet et al., 1981). (The PB4Y-2B Privateer was an extensively modified B-24 Liberator many of which remain flying as fire-fighting slurry-bombers in the US and Canada). As an aside, the Navy also experimented with the much smaller Vought F4U-4 Corsair (Sullivan, 1994). The first operational use of the Bat occurred on April 23, 1945 when Privateers of VPB-109 launched two Bats against Japanese shipping near Borneo. VPB-109 had been the first squadron to be equipped with the Bat, but was followed soon thereafter by VPB-123 and VPB-124 . Without an enemy, post-war Privateer crews had to maintain their proficiency by attacking icebergs in the North Atlantic with Bats. In 1953, an upgraded version of the Bat (ASM-N-2A) made it's appearance but was removed from naval inventory soon thereafter. NOTE: This is the second of two articles providing information on bats that have served as military insignia in the armed forces. The first article dealt with bats that were enlisted as United States Navy and Marine Corps insignia (Pedersen and Siegfried, 1996). Here, I present further information on the use of bat-related insignias and weapon systems used by units of the United States Air Force, the Royal Air Force and its commonwealth air forces. 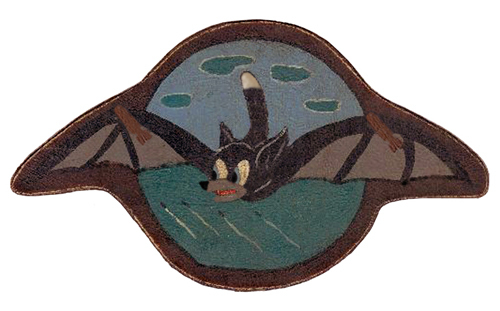 Like their cousins in naval aviation, pilots of the U.S. Army Air Corps, which became the United States Air Force (USAF) 1947, have included bats in their squadron's insignia because of the animal's remarkable ability to navigate and attack in the dark. Indeed, bats have been a popular design for nightfighter and reconnaissance squadrons in the air forces of the United States, England, and Canada since World War Two. 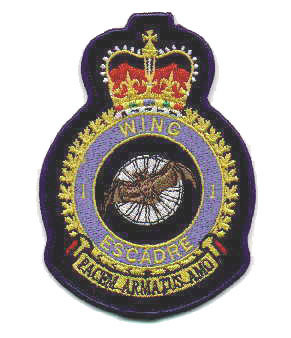 Typically, squadron insignia are unique, designed to represent the unit, and even depict the unit's assignment (e.g., bomber squadron). Insignia are found painted on squadron aircraft and equipment, whereas cloth patches bearing the same design decorate flight jackets. Official insignias of the USAF conform to regulations governing size, shape, and the political-correctness of the design. However, ubiquitous, unofficial insignias vary in size and shape, and tend toward the humorous, irreverent, and even pornographic. 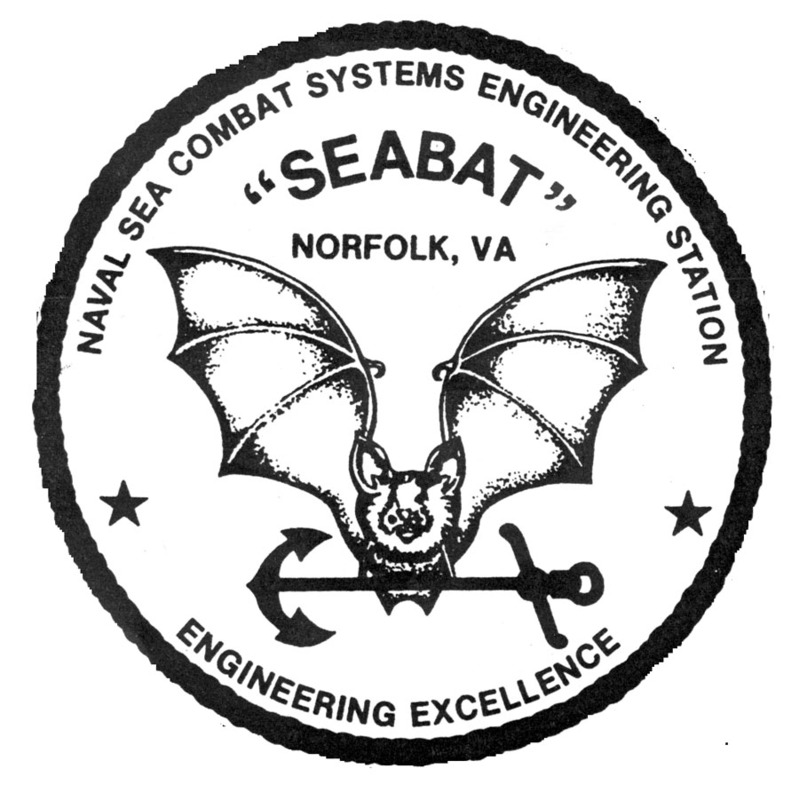 Unlike U.S. Navy insignia that tend to utilize whole bats in the design, insignia of the USAF depict bat-winged objects such as bombs, skeletons, devils, and various animals. 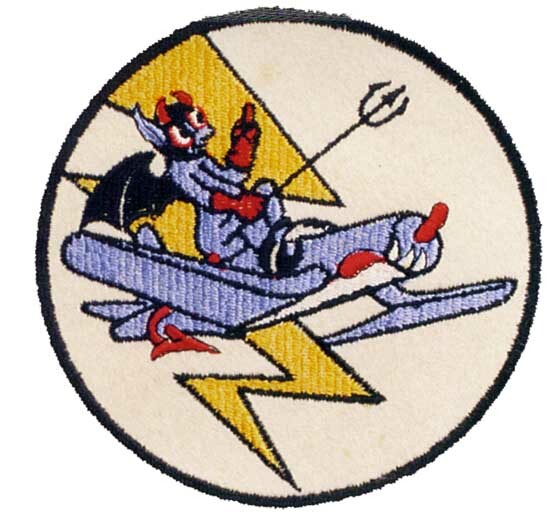 Like the Navy, once a design is chosen (e.g., a bat) it may be shared among related squadrons in the same air group or combat wing, retained by a squadron for many years despite changes in their assigned mission (e.g., fighter to attack squadron), or reused by another squadron after the original unit is disestablished. Left to Right: 318th Bombardment Sqd. ; 392nd Bombardment Sqd. 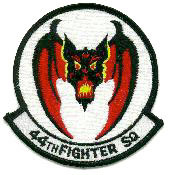 ; 44th Fighter Sqd. ; Blind Bat Flareship Ops. 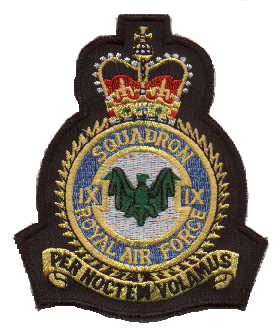 In direct contrast to the insignia employed by the USAF, USMC, and USN, bats that appear in the heraldry of the Royal Air Force (RAF), the Royal Canadian Air Force (RCAF), and the South African Air Force (SAAF) are relatively simple in design (Fig. 3). They are framed by a formal badge and must conform to strict heraldic guidelines (Mann, 1944; Moyes, 1964; Rawlings, 1969). Caricatures fall into four distinct types: pteropidid-like animals - 153 SQD and 724 Unit, stenodermine-like animals - 9 and 966 SQD, vespertilionoid-like bats - 162 and 440 (RCAF) SQD, SCAAME, and animals meant to represent, but bear no resemblance to, vampire bats - 4 SQD, 25 Group, 203 AFS, 595 SQD (each of these squadrons were at one time equipped with de Havilland Vampire aircraft). 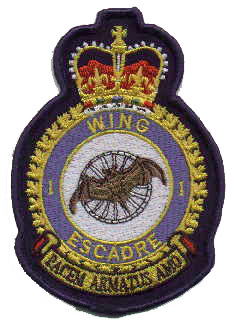 Left to Right: RCAF 1 Wing; RCAF 440 Transport & Rescue Squadron; RAF 9 Squadron. Bats have appeared in nose-art, or as aircraft nicknames painted on the sides of individual airplanes. 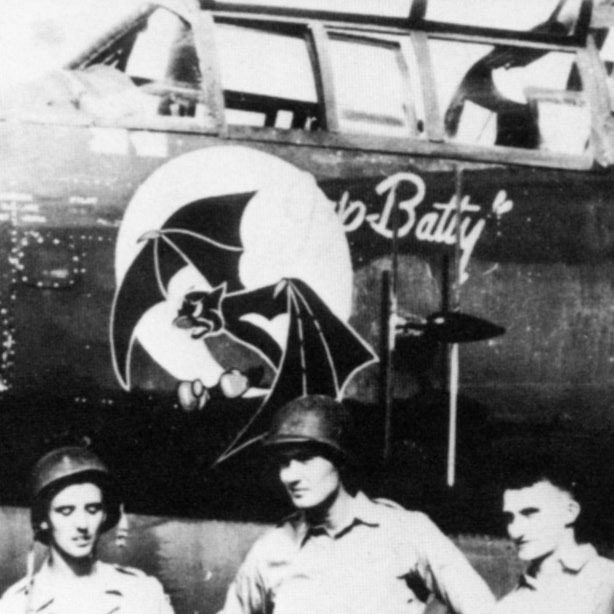 For example, during WWII, the nose-art of a 6th Nightfighter Squadron Northrop P-61A-1 Black Widow depicted a large bat wearing boxing gloves on its hind feet (named "Jap Batty"), whereas the nose of another P-61A of the 548th Nightfighter Squadron was graced with a painting of Batgirl (named "Bat outa Hell"; Davis and Menard, 1990). 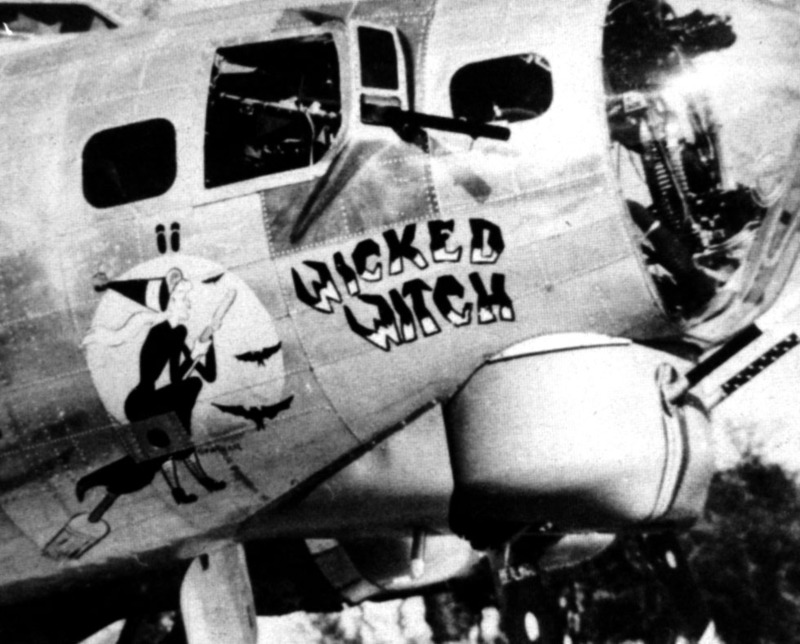 Boeing B-17G Flying Fortress "Wicked Witch" with bats (USAF Museum) More examples of bat nose-art? One group of particular interest was the 499th Medium Bomb Group that operated in the Pacific during WWII. Their unit flew the North American B-25 Mitchell that had taken part in the first bombing raid of Tokyo much earlier in the war, one of these being named "Lucky Bat" by her crew. This group was involved in ground-attack missions and anti-shipping strikes and each aircraft in the squadron had the entire nose section painted to look like the head, body, and wings of a huge bat. More examples of bat nose-art? Project Batty was an early attempt by the USAF to use remote-controlled, stand-off weapons to attack well-defended or "hardened" targets (Lloyd, 1986). 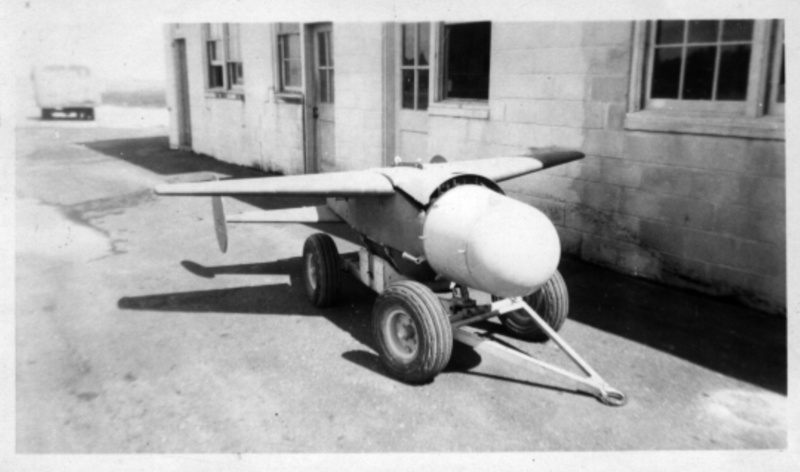 This Project utilized the GB-4 glide bomb. This device was composed of a 2,000-pound general Ordnance bomb strapped to a simple 600-pound glider that was 12 feet long with a 12 foot wingspan. As the bomb dropped away from the "mother-ship" (Boeing B-17G Flying Fortress) magnesium flares in the tail of the GB-4 would ignite to help the bombardier follow the trajectory of the bomb across his television screen/bomb sight. Though television was still in it developmental infancy, it was sufficient to aid the bombardier as he controlled the path of the glide bomb by radio-control. Late in WWII, Project Batty was used against German-occupied facilities at the port of LeHavre, France, with dubious success. In summary... The majority of bat insignia depict either caricatures of bats or vertebrate chimeras that possess bat wings. However, at least one represents a Family crest. 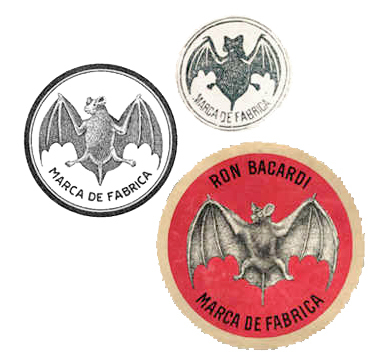 It has been suggested that the "Cuban Fruit Bat" depicted in the earliest insignias of the United States Navy (VCS-2, VO-3, VS-5, and VS-6) was based on the well-known Bacardi rum label. This is unlikely because the early USN bats are tail-less. However, this is not to say that Bacardi rum wasn't involved at some point in the decision making process of these early aviators. 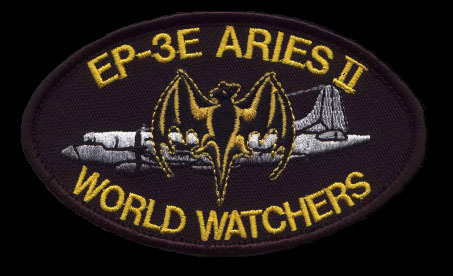 Of interest, the classic Bacardi logo has recently reappeared in VQ-1's EP-3E Aries II patch presented below. Left to Right: VCS-2 (JLP Morgan); Bacardi Logos (Bacardi); EP-3E Aries II aircraft of VQ-1 (G. Dysico). Acknowledgments: This work is dedicated to the men and women of the armed forces of the United States of America. I offer this compilation of material in grateful appreciation to those who have worn these patches during service to their country. Photo/patch credits: I have tried to provide accurate information as to the various sources of patches, figures, and photographs throughout. I wish to express my gratitude to the following for donating text, photographs, patches, advice, and support throughout the project, and the list is long....., Altevogt C, Andrews H, Atherton M, Augustus J, Baker W, Baller J, Barnard D, Barth B, Biss G, Brigham M, Brotherman T, Brown E, Broze V, Caldwell D, Caniff M, Clark J, Conte T, Cook J, Cook S, Copeland M, Daniell R, Delve K, Denton-Boomsma M, Dysico G, Edwards G, Elliott P, Esposito P, Felt B, Ferrin R, Frankel N, Gager S, Gindes S, Goodspeed H, Greer D, Grossnick R, Hatch M, Horst R, Hunt W, Jacobs J, Jacobs, H, Johnson R, Karabin B, Klunder R, Krueger A, Krus C, Kurta A, Landerville R, Lemerande T, Lieurance D, Manly P, Marlow K, Martin D, Massa A, McCracken G, McDowell E, McGowan S, Mersky P, Millstein J, Morgan J, Mormello F, Morrison J, Nicosia L, Paradie F, Paulsen J, Peters R, Petersen G, Rabine J, Reed B, Reed H, Register C, Rice C, Roberts M, Robinson D, Robinson J, Ross C, Saunders H, Siegfried D, Slater C, Slizeski R, Spears F, Spink B, Talbot M, Trombecky B, Wagner A, Walters J, Wingrin D, Woodard B, Woodburn J, Woolsey R, Wright B, , and I am sure I missed a few of you! Omissions and/or inaccuracies are entirely unintentional, and the author would sincerely appreciate corrections and editorial comments to improve this body of information. Bell, D. 1979. Air Force colors, Vol. 1: 1926 - 1942. Squadron/Signal Publications Inc., Carrollton, TX. Britton, J. 1990. U.S. military shoulder patches of the United States Armed Forces. 5th ed. MCN press. Tulsa OK.
Brown, K.S. 1961. United States Army and Air Force Fighters, 1916-1961. Harleyford Publications, Letchworth, Herts, England. Buford, R., and W. Boyd. 1953. U.S, Navy Bureau of Ordnance in World War Two. U.S. Government Printing Office. pp. 342-343. Davis, L. 1987. B-24 Liberator in action. Squadron/Signal Publications Inc., Carrollton, TX. Davis, L. 1990. Planes, Names, and Dames, Vol. 1: 1940-1945. Squadron/Signal Publications Inc., Carrollton, TX. Davis, L. 1993. Wild Weasel, the SAM suppression story. Squadron/Signal Publications Inc., Carrollton, TX. Davis, L. and D. Menard. 1990. P-61 Black Widow in action. Squadron/Signal Publications Inc., Carrollton, TX. Doll, T., B. Jackson, and W. Riley. 1983. Navy air colors, United States Navy, Marine Corps, and Coast Guard aircraft camouflage and markings, Vol. 1: 1911-1945. Squadron/Signal Publications Inc., Carrollton, TX. Donald, D. 1992. US Air Force airpower directory. Airtime Publishing Inc., West Port, CT.
Donald, D., and J. Lake. 1992. US Navy and Marine Corps airpower directory. Airtime Publishing Inc., West Port, CT.
Drendel, L. 1978. TAC, A pictorial history of the USAF Tactical Air Forces, 1970-1977. Squadron/Signal Publications Inc., Carrollton, TX. Drendel, L. 1982. Airwar over Southwest Asia, a pictorial record, Vol. 1: 1962-1966. Squadron/Signal Publications Inc., Carrollton, TX. Drendel, L. 1990. USMC Phantoms in combat. Squadron/Signal Publications Inc., Carrollton, TX. Grossnick, R. 1995. Dictionary of American naval aviation Squadrons, Vol. 1. U.S. GPO. Washington, DC. Halley, J. 1988. The squadrons of the Royal Air Force and Commonwealth 1918-1988. Air-Britain Ltd., Kent, England. Hallion, R. 1986. The naval air war in Korea. Nautical and Aviation Publishing Co., Baltimore, MD. Horst, G.R. 1992. Dept. of Exotica, Erotica, Etcetera. Bat Research News, 33:5. Hubbard, B. 1943. Aircraft insignia; Spirit of youth. National Geographic, 83:710-722. Huff, W. 1950. The Navy's 'Bat'. Naval Aviation News, 38:1-5. Larkins, W.T. 1961. 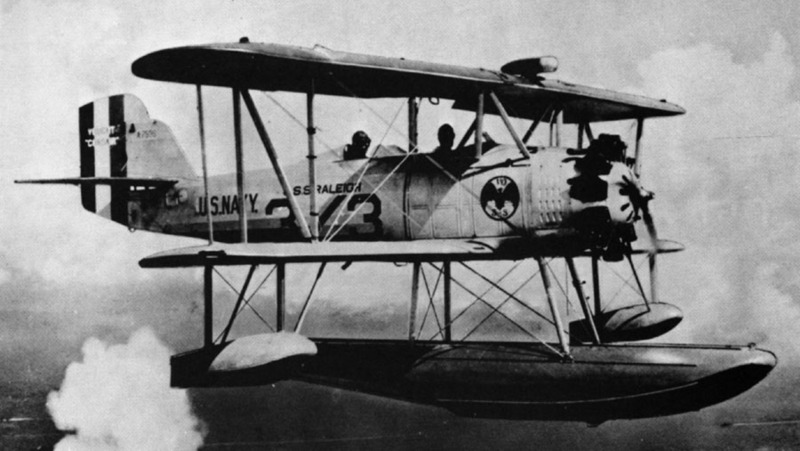 United States Navy aircraft, 1921-1941. Aviation History Publications, Concord, CA. Lloyd, A.T. 1986. B-17 Flying Fortress in detail and scale. Tab Books Inc., Blue Ridge Summit, PA.
MacGlashing, J. 1995. 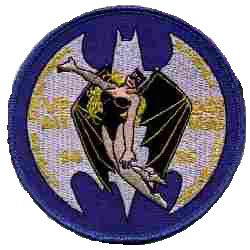 Batmen, Night Air Group 90 in World War II. Phalanx Pub., St. Paul, MN. 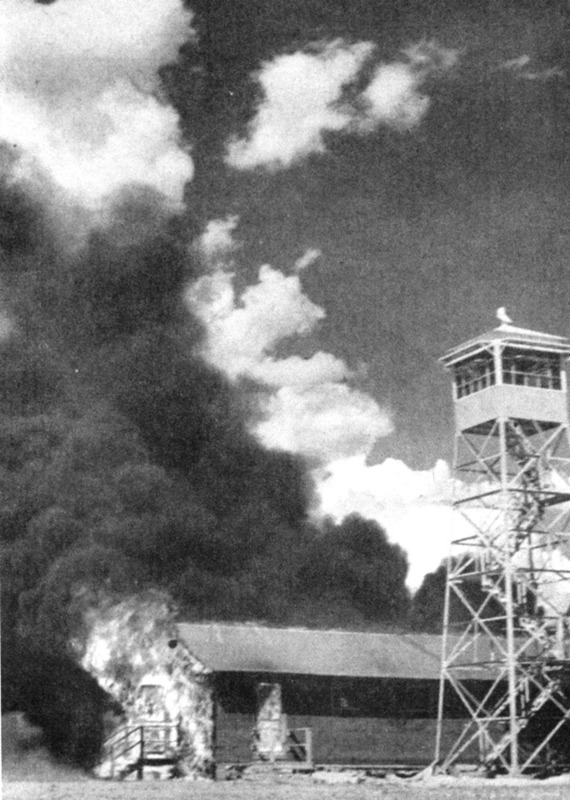 Mann, C. 1944. Air heraldry. McBride and Co., New York, NY. Maurer, M. 1969. Combat squadrons of the Air Force, World War II. U.S. Government Printing Office. Washington, DC. McCracken, G.F. 1990. Project X-Ray: the World War II Bat Bomb. Bat Research News, 30:72A. Moyes, P.J.R. 1964. Bomber squadrons of the Royal Air Force and their aircraft. MacDonald and Co., London, England. Mutza, W. 1996. Lockheed P2V Neptune - An illustrated history. Schiffer Ltd., Atglen PA.
Nelsen, D., and D. Parsons. 1990. Official and unofficial US Navy air patches. Motorbooks Int., Osceola, WI. Ravenstein, C.A. 1984. Air Force combat wings, lineage and honors histories: 1947-1977. The United States Air Force reference series. U.S. Government Printing Office. Washington, DC. Rawlings, J.D. 1969. Fighter squadrons of the Royal Air Force and their aircraft. MacDonald and Co., London, England. Rawls, W. H. 1992. Disney dons dogtags. Abbeville Pub., New York. Roberts, M.L. 1995. United States naval aviation patches, Vols. 1-3. Schiffer Ltd., Atglen PA.
Robertson, B. 1967. Aircraft markings of the World, 1912-1967. Letchworth Printing Ltd., Letchworth, England. Robertson, P. 1962. United States Navy and Marine Corps Fighters, 1918-1962. Aero Publications, Los Angeles, CA. Sullivan, J. 1994. F4U Corsair in action. Squadron/Signal Publications Inc., Carrollton, TX. Sullivan, J., and D. Lucabaugh. 1993. Golden wings, 1941-1945, (USN/USMC aircraft of World War II), Squadron/Signal Publications Inc., Carrollton, TX. Van Vleet, C., L.M., Pearson, and A.O., Van Wynen. 1981. United States Naval Aviation, 1910-1980. Government Document, NAVAIR 00-80P-1. The author strongly encourages corrections and additions to the website.